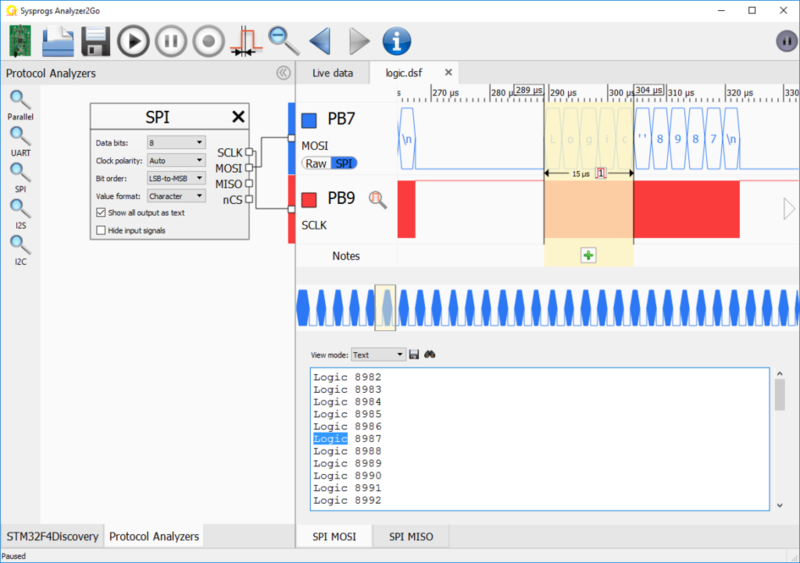 The idea of making a “soft logic analyzer” that will run on top of popular prototyping boards has been crossing my mind since we first got acquainted with the STM32 Discovery and Nucleo boards. The STM32 GPIO is blazingly fast and the built-in DMA controller looks powerful enough to handle high bandwidths. So having that in mind, we spent several months perfecting both software and firmware side and here is what we got in the end. The STM32 DMA was unexpectedly fast. It can reliably read GPIO inputs every 3th or 4th clock cycle on many devices. For fast boards like STM32F746-Nucleo this means sampling frequencies up to 72 MHz. If the CPU is properly stalled for the duration of the sampling, it is extremely precise given that it is configured properly. Sampling the inputs at the maximum speed imposes an important limitation. Once the on-board RAM is filled with the data, the sampling needs to be stopped to transfer the data to the computer. While capturing ~1ms at 72MHz could be sufficient for fast and periodic signals, it could be hard to catch the interesting part if the signal is sparse. To support that, we experimented with doing double-buffered compression: while the DMA was filling half of the buffer with raw samples, the CPU was reading through the other half and doing a very basic compression. This brought back the challenge of uniform sampling: if the CPU was not just waiting, but actively accessing the memory, the DMA controller had to compete with the CPU for the RAM access and could not keep up the sampling uniform. The key to resolving this was to optimize the memory access patterns of the compression algorithm. Having them spaced far enough apart and lowering the sampling frequency to allow the CPU to keep up brought back very precise sampling at a rate of 6.2-8.4MHz for most boards. Checking for the trigger would mean not stalling the CPU while the capture was active, and that undoubtedly disrupted the uniform capture pattern. The solution here was to use the external interrupt controller and carefully timing the memory access patterns of the interrupt-related code to avoid interference with the sampling. The result was worth the effort: for most of the boards the triggered mode was significantly faster than the compressed mode. We also added trigger support for the compressed mode that works with slightly lower sampling frequencies. Being inspired by the sampling quality in the compressed mode, we decided to try another idea: how far can we go if we setup 3 processes in parallel: sampling the data, compressing it and transferring the compressed part to the computer non-stop? The result was surprisingly good: lowering the sampling frequency to ~6MHz for the fastest boards and playing around with memory access patterns got precise non-stop sampling, so we could record hours of non-stop activity on slower buses like I2C not being limited by the on-chip RAM anymore. Clicking at the signals immediately adds them to the live view, beginning to show the current signal. 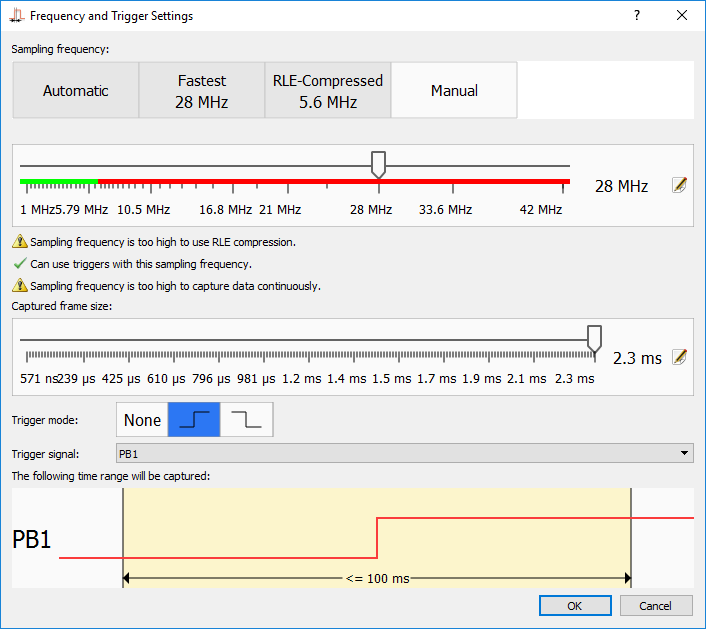 The frequency is chosen automatically (unless set manually) by first trying to sample the signal as fast as possible, and if it looks slow enough, retrying in the compressed mode. We also added a “trigger” column that allows enabling and disabling triggers by just clicking on the corresponding signal as a quick alternative to going deep into capture settings. 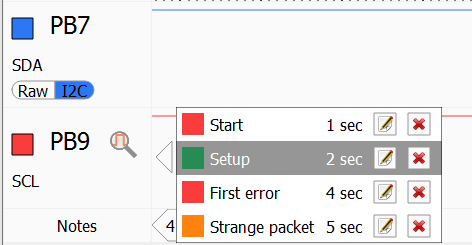 We also added a similar mode for the asynchronous signals where the selection is split based on time instead of clock edges. 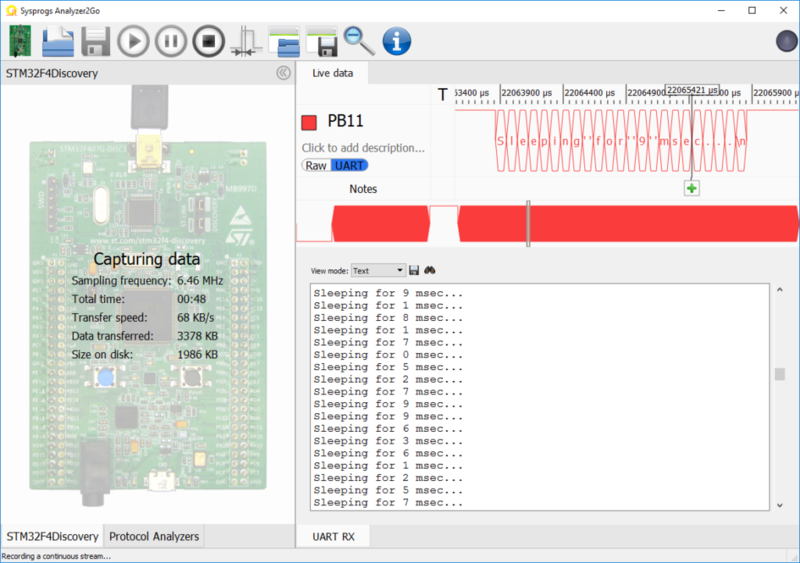 We have also added automatic analyzers for commonly used protocols like UART, SPI, I2S and I2C. Dragging them to the protocol analyzer panel and connecting the inputs automatically replaces the raw view with a higher-level view showing the decoded data: Playing around with the protocol analyzers, we quickly discovered another challenge: displaying the decoded bytes in place of the original signals can only show a small amount of text before it gets zoomed out too much and decoding everything as text makes it hard to see the timings and values of other signals. The pane shows all the decoded output from the entire frame (or file), allows browsing through it and doing full-text searches and it’s automatically synchronized with the timing view: selecting some characters in the text view will automatically select the corresponding time range and selecting a time range will highlight the characters belonging to it. After months of resolving hardware and software challenges and tweaking the usability, Analyzer2Go was born. It currently supports 8 popular boards from ST and runs on Windows. Support for more boards and other operating systems is coming soon. The hardware is capable. The software is mighty. 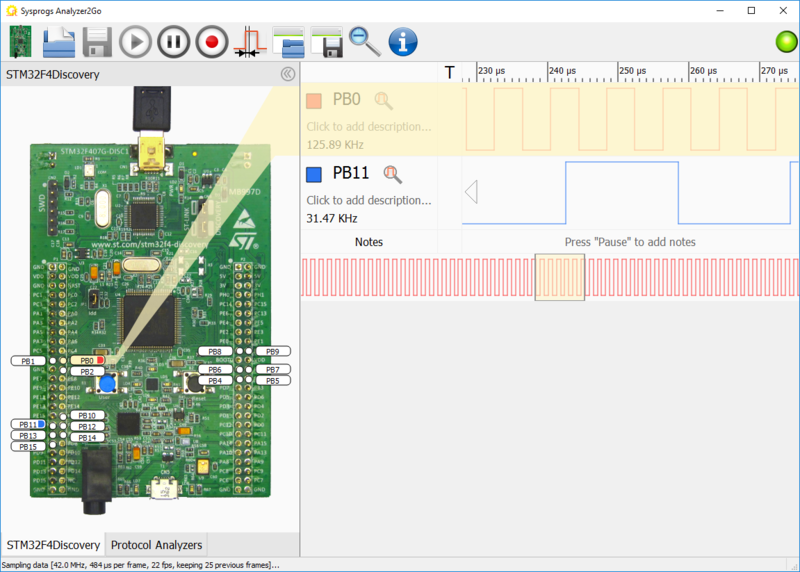 So go ahead and send us your feedback and suggestions for new boards to support and we will turn your board into a reliable and easy-to-use logic analyzer next!